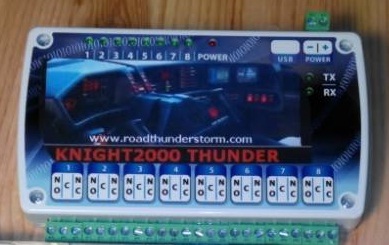 KNIGHT2000 Thunder Voice Console is a completely new platform built with special graphics specifically designed for a perfect match to the style Knight Rider. - Multimedia Player ( Audio , Video, Film) with spectrum analyzer , graphical effects , read MP3 info , playlists, etc. - GPS Tacho Meter Satellite Info Center with Massage for real-time some interesting and useful information: time and average speed in kph or mph , on -screen display . - Acceleration of the car. - Altitude in meters or feet . - The direction of travel relative to the ground - an indication of the Latitude and Longitude and their graphical representation . - Graphical presentation of the satellites on the horizon , visible and those in use. - The number of visible satellites , as well as their details , such as power, position . - Graphical representation of the time course of the velocity . 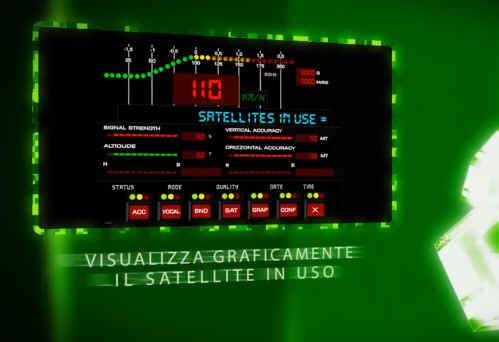 - Display of the satellites on the horizon Monitor 1 or 2. 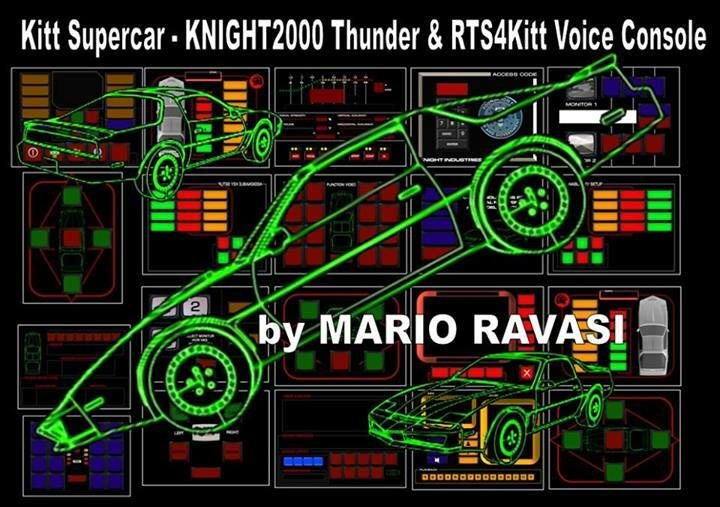 The KNIGHT 2000 Thunder Voice Console is the interactive platform designed specifically for replicas of KITT, so as to allow a simple interaction with simple voice commands and make driving more fun as possible without taking your hands off the wheel. Special graphics specifically designed for a perfect match to the style Knight Rider. 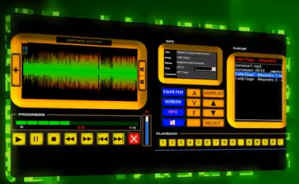 New features, special effects graphics, internet technology, Satellite and much more. KNIGHT2000 Thunder is a completely new and rewritten from scratch, using technology from Microsoft, Visual Studio, then a set of real programming languages. This is not a conglomeration of several different programs made by various manufacturers and sold as owners, but rather an integrated platform, where the code has been written line by line from scratch in 'Area Development RoadThudhnerStorm (RTS Development Department). All individual modules, such as the media player, the projector Sound, Motion Detection on Multi WebCAM, Web Radio Ultra Video players were written line by line using the native Windows API, so Microsoft technology for Microsoft Environment. The only exception is the Navigator and Tool OBD products that are provided by Third Parties, but that they will also be made at home for a short iun perfect match to the style Knight Rider. Behind the creation of the software there is a study and research (by 's RTS Research Department) in order to:. - Implement a software for as much as possible in line with the television series, for the management of the replicas of KITT ..
- Create a graphical particular: 800x600 created specifically for monitor 5 "mounted in the replicas and studied, with the support of a Study of Information Design, for a perfect match with the graphics and the colors of the dashboard ..
- Have new sounds taken directly from the television series, and rebuilt in the studio in digital, absolutely faithful to the TV series .. 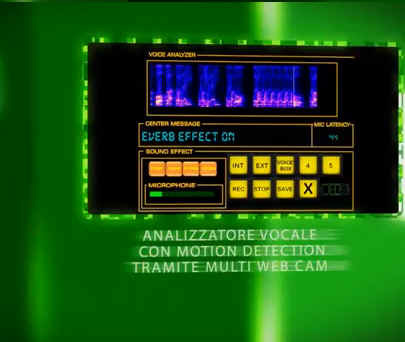 It should be noted that the 'voice use that is made at the level of Car-PC is very limited, and the two programs for the purpose almost equate, because both software are used to ask to recognize individual words (eg Hello) or more than 2 or 3 words (eg How are you, Open the glass, ..), it is not a fact-intensive and heavy as the dictation of long texts in a text editor (such as Word or Excel) or used to interact with Windows with voice commands complex and far. ViaVoice is now out of production and for the occasional user is complex installation in the latest generation of Operating Systems (XP post which is now destined to oblivion as has been shown by one of the most reliable systems), even if the recognition engine does not lose its compatibilià with them, because ViaVoice part and is resident in memory, only you can not see the GUI and is not controllable. Dragon is instead continually manuntenuto with new releases, and therefore more accurate in understanding, which is known mostly in the case of intensive use as mentioned above, and less in the case of simple commands such as 2 or 3 or even single words. ViaVoice, however, is much more versatile and easy to use, as well as lighter software to keep active in memory to the PC and has a cost of reduced resources compared to that in the PC Dragon carozzati instead might seem a little slower in their responses. Roadthunderstorm, in the XP installations continues to use ViaVoice, for the reasons stated above. - The communication between the modules is via the RS485 protocol that does not suffer from signal loss typical of USB (max. 5 m) , it can reach a maximum distance of 1200 meters (1 km and 200 m ), then there is a possibility to keep the modules also very distant from your PC without having to use powered USB hub to boost the USB signal . The RS485 protocol allows in fact a very high transmission speed (35 Mbit / s to 10 m and 100 kbps to 1,200 m). Since it uses a signaling system with a voltage rating not negligible , with a balanced line through the use of a pair (as in EIA RS- 422) , you can reach relatively large distances (up to just over 1,200 m note ) . The software is compatible with cards but RELAY 'provided by third parties, because it is designed in a modular way, ie there is an intermediate form that adapts automatically to the type of relay board used, but it must be known a priori. Ut wisi enim ad minim veniam, q uis. For the determinazine Movement ( M ) has been used an effective algorithm based on the coefficient of correlations between two variables ; fact The movement is calculated based on the difference between these two variables , namely our images (i1 , i2) , in two instants thereafter. The degree of correlation between the two variables is then expressed by the so-called correlation indices (CI ) . M = f (IC) dove IC = f (D (i1, i2), D (t1, t2)). - Dettagli dei Satelliti, quali potenza, posizione, ecc. The Knight Rider Speedmeter is the natural evolution in perfect style Knight Rider, the RTS Voice Module Speedmeter presented in 2008 . - The number of visible satellites , as well as their details , such as power, position , etc. .
Not only with the Scrolling display may have under control much more info .. In fact, the operation of NAVSTAR is based on the system of military satellites operated by the U.S. government , 24 + 3 spares , sending a series of digital sequences in which the distances are calculated . RTS4KITT Knight Rider Speedmeter as each GPS receiver , can visualize , apart from exceptional cases , at most 12 , or the satellites located in the hemisphere of belonging . The distance between the satellites and the receiver is calculated by measuring the time necessary to receive the signal from the satellite that issued it . To take the two-dimensional G.P.S. must "hook " at least three satellites. After that has been calculated the distance to each satellite in the GPS calculates a space in which positions the three spheres of radius equal to the distances available . One gets two intersections : one is the station point of the GPS and the other is directly opposite that is discarded. This position is two-dimensional and therefore carries with it a minimum of error because up to this point was not taken into account the height above sea level of the receiver . It is necessary a third point to obtain a three-dimensional measurement . It is obtained by hooking the signal from a fourth satellite . Of course, the growing number of satellites contacted decreases the rate of the error. The ' Knight Rider RTS4KITT Speedmeter will only activate in this case, to avoid providing inaccurate measurements .